New York : Random House, c2009. 31 p. : col. ill. ; 23 cm. Kiss the frog / by Melissa Lagonegro ; illustrated by Elizabeth Tate ... [et al.]. 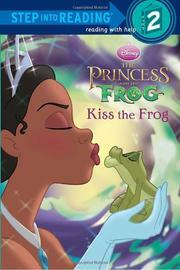 At head of title: Princess and the frog. 100 ME:PersonalName 1 $a Personal name Lagonegro, Melissa. $c Statement of responsibility by Melissa Lagonegro ; illustrated by Elizabeth Tate ... [et al.]. 500 General Note $a General note At head of title: Princess and the frog. 521 Target Audience 1 $a Target audience note Preschool-grade 1.